There are important things to remember when it comes to owning a car, and one of those is making sure you have the necessary equipment in case you have an emergency like a flat tire. Flat tires can happen in many different situations, and it’s important to be prepared. Whether your car is parked in your driveway or you come back from an errand to find a flat tire, dealing with a flat tire when your car is already parked is a lot less stressful than when you’re driving. The first thing to do is inspect the tire. Run your hands along the back and front of the tire to find any foreign objects like nails or staples. If there is no object, you could just be low on air. If you find a puncture or hole, put on the spare tire and drive to a secure service center for repairs or patching. Driving on a spare for too long can damage the tire casing and integrity. If you don’t hear the flapping from your tire, you’ll feel it. It will feel like your vehicle is being pulled to the side where the tire is flat, and it’ll feel like you can’t accelerate. First, you’ll want to pull over. Get as far to the edge – hopefully a shoulder – as you can. You want to give a lot of space between you and passing cars. Most importantly, don’t drive on it. Put on the spare and drive to the nearest service center to have it checked out. It’s important to always have your spare handy. In more recent years, some manufacturers have not been including a spare when you buy your car. It’s been a slow change, but if you notice it, you should go out and buy one. If you haven’t, you’ll want to be prepared in other ways. Be prepared and have a tire repair kit ready for use. They usually come with tools like a sealant and air compressor, but these are only temporary solutions. You’ll want to head to a service center as soon as possible. A reliable roadside assistance program can also help you out. Companies like AAA will send out assistance when you call them. So, as long as you have a cell phone, you can contact help. If you don’t have AAA, there are many other ways to receive roadside assistance. Check with your insurance provider. They may offer you roadside assistance as part of your insurance plan, or you can add it on for a small additional fee. They will provide you with help when you have a flat tire and with emergency towing. Even if you don’t have the plan with your insurance provider, you can always use your phone to call a local towing company. It might be a little pricey, but it’s one of the only solutions if you don’t have your spare tire or a roadside assistance program. You will also feel your vehicle slow down and pull strongly to one side. If it’s one of the front tires, you’ll feel the vibrating in the wheel and if it’s one of the back tires, you’ll feel it in the seats. Keep a firm grip on the wheel and do not slam on your brakes. Let your car slow down and pull safely to the side at a slow speed. Activate your flashers and change your tire or call roadside assistance. Remove wheel cover – To remove the wheel cover, you can use a flathead. Loosen lug nuts slightly – You want to loosen them, but not take them off completely. Jack up vehicle – If you have a hydraulic jack, you’ll insert the handle and pump it up and down. For a scissor jack, take the wrench or rod, insert, and crank. 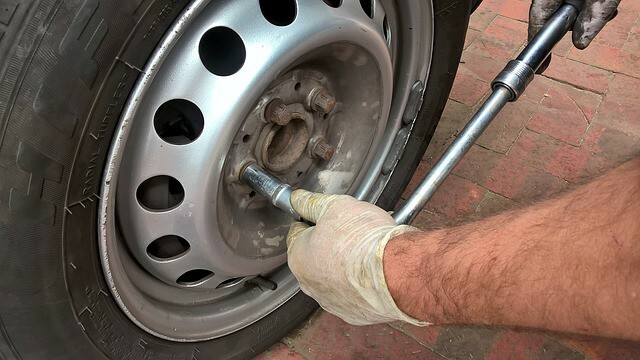 Remove the flat tire – Take off the lug nuts by hand and pull the tire off toward you. To get it out of the way, roll it towards the back of your vehicle to keep away from cars passing by. Place the spare on – Lift the spare into place on the lug bolts and secure the lug nuts into place. Lower your vehicle – Turn the jack the opposite way to bring it back down. Tighten the lug nuts as much as possible. Put wheel cover back on – Use your hands to place the wheel cover back on to avoid dents from a hammer or other tool.